This is the story of the oldest tree on the Glastonbury Festival site, in the back corner of the Green Kids field, within the Greenfields. It is over 500 years old, and we in Green Kids Area have always felt incredibly proud to be its “guardians” during festivals times. Like all good ideas the Oak Tree Project started as a little acorn – we planted the seed, it is being nurtured and cared for, and evolving into a story. As the thoughts grew we asked Michael if we could put it on the website, and he agreed. Our hope is that, like the tree, and like the Festival, the Oak Tree project grows and grows for many years to come. We would like for everyone who has memories, associations, funny stories, photos, or any other comings and goings with the Oak Tree, to send them into us and we will add them to the collection here, as a permanent reminder of the beauty of time and wood. We welcome any contributions to any part of this story. We have been lucky enough to set up our children’s Book Lounge in Green Kids for a number of years, and my daughters and I – as well as the many people who have helped over the years – love the Big Oak Tree. 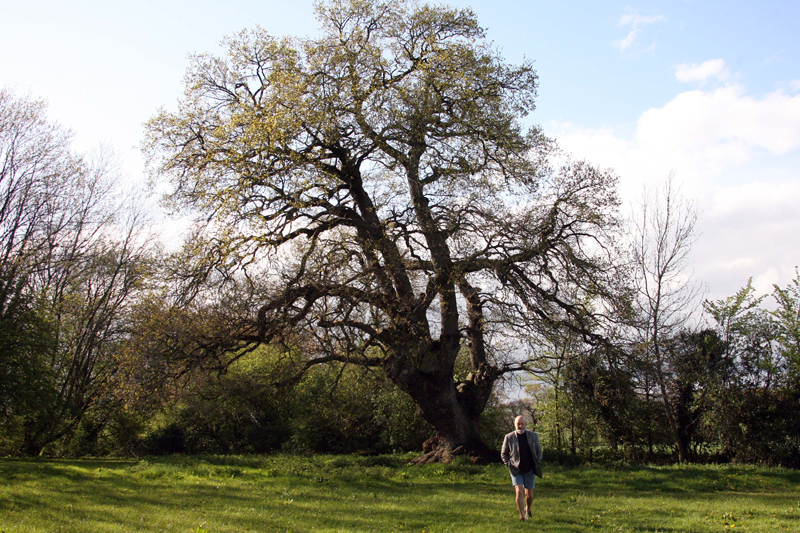 In 2016, Jos gave me a seedling she had grown from this venerable oak to take home to Wales. I have been looking after it in memory of Sylvie, my baby grandchild, who was born and died in May 2016. The baby oak is growing and flourishing, while Sylvie’s mother Ellie, who has often rested under the big oak, now has a new baby, Rory. We’ll always remember Sylvie, whose name recalls woods, and hope that in a while the young oak will be planted in the churchyard near her grave. My name is Magpie Dragonteller and I have been telling stories and elfing around the Great Oak for over 16 years. How lucky am I! About 10 years ago something lovely happened to me whilst I sat under the tree on a sunny festival day. Here is my tale, and yet not my tale. Here is a possible sample of ancient folklore, as I heard it told to me. I hope you enjoy it. Crick Crack, story out of my sack………………. I was reading a story that I hoped to tell to families later in the day, when a traveller man all tanned and smiley came and sat beside me. He asked me what I was doing and I told him. “You’re a storyteller, how fantastic. We have so many old tales of the gypsies that are being lost, dying out. Shall I tell you one?“ I felt like the tree had given me such a blessing and tried to contain my excitement. I listened. He repeated phrases a couple of times in the hope that I had a photographic memory, and I endeavoured to learn the story properly. I have to admit some of the end is blurry, so I have embellished it, as is the way of the teller. This is as much as I can remember…. “In the beginning there was nothing and from that came the first dragons and they were called the Oonari. They were the creatures that gave life to all living things. From them came the second generation of dragons and they were called the Gatherers and they shaped the world and all that lived on it. From the Gatherers, all other magical animals were born; Griffons, Unicorns, Phoenix and too many more to mention. Then came those who walked on two legs. They travelled across the world. Many tribes of traveller folk, following the seasons and animals. These travellers were happy when they were on the move. At some point in history, people began to settle on the land. Once they forgot their nomadic ways, they looked down on the remaining travellers as if they were enemies. A man came into the world, a special man. For many moons he lived a normal life with other travellers. In 36 years the man suffered many hardships and the world threw many challenges in his direction. People he loved, died. Places he adored, were destroyed by landowners. This man was a wanderer, a traveller, a gypsy. He was also to be known as the Gypsy King, even though he did not know it yet. On his 36th birthday he had a dream. A huge black dragon appeared and told him how the world began, as I have just told you. He awoke from his dream and told other travellers of what he had dreamt. They knew it to be true. “I am not the Gypsy King,“ the man insisted. So the man travelled for a year and a day, but had the most extraordinary adventures. He was faced with challenges, threats, battles and dangers as he come upon many mighty animals. From badger, otter, owl and mouse and too many more to mention. Many adventures did he have with the wild ones and he knew after a year and a day, he knew who he was. “I know I am, “ he replied. And then he finished. I will apologise to anybody who knows this story, if I have made too many errors. I just think it’s worth recording what I know. His name was Noah, so thank you Noah for your beautiful gifts. Before he left me he gave me a small painted flowerpot and said it should not be broken. I still have the flowerpot. He then gave me a small silver unicorn with wings, I kid you not. He told me this would bring luck. He left. I did have the most tremendous year, I remember it well. It was just before I met my Faery Queen wife. A friend of mine had some terrible tragedy and was facing a life destroying challenge. I leant her the unicorn and all her troubles lifted that week. Unfortunately, she lost the unicorn, but I’d like to think it served it’s purpose. I am going to be under the tree this year and as many more as I am allowed. If anybody knows more stories about the Gypsy King, please come and find me. I feel like it is unfinished business. Perhaps, now that you’ve read my version of your old Gypsy past, you might feel I could be entrusted to write down more gems. Crick Crack, story back in my sack. This message is to the lady who is in charge of the green kids field where the 500 year old oak tree is. This lady, so sorry I cannot remember your name, you have long grey hair, and you were so kind to me and you asked me to send you an email telling my story. My name is Jackie, the mother of Darren. In 2014 my son Darren and his partner Kelly persuaded me and the rest of the family to go to Glastonbury – there was Me, my eldest son Justin, Darren, my daughter Latesha, Justin’s wife, and Martin, who is like family I call him my adopted son. I had never been to a festival in my life, I was 58, we stayed at E17 field in 2 camper vans, it was an amazing experience. 2016 would have been Darren’s 40th year and my 60th year; so we decided to go again but this time stay in a Tipi. Darren paid for the Tipi, and we planned to go as the whole family. At the end of November Darren died suddenly of a heart attack, which has and still devastated us all. I decided to bring some of Darren’s ashes to leave at Glastonbury. At that point I didn’t know where I would leave them. 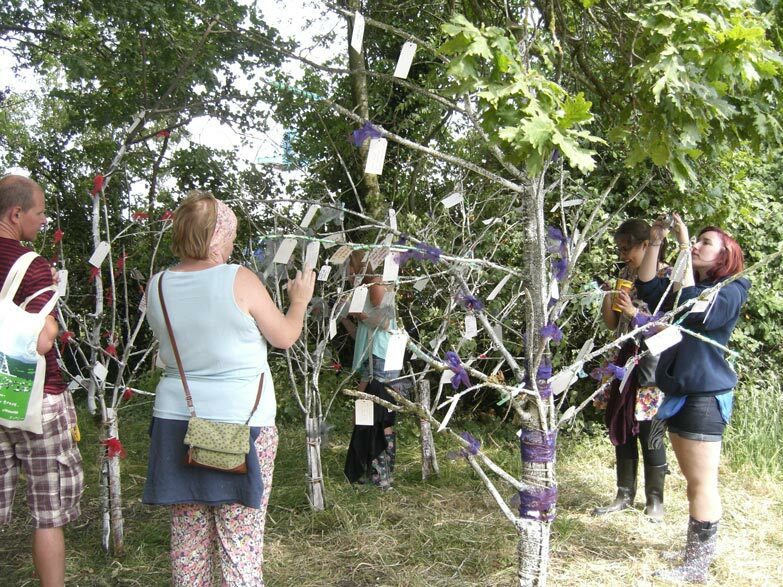 Then when I was looking at Glastonbury’s official website, I spotted the Oak Tree Project, at that point I knew exactly where I was going to leave his ashes. When I came to Glastonbury I wasn’t sure where the tree was, but I knew I would find it, while walking around Glastonbury I noticed another splendid tree near the site where Arcadia is, I then began to feel anxious and unsure exactly where the tree was. In the evening around the fire at the tipi village I was asked by a gentleman called Ray what I had come to see, I told him some of the bands I was hoping to see and also relayed to him Darren’s story, I also told him of my worry about the exact location of the 500 year old oak tree, bless him he Googled it and told me the tree is in the green kids field, I thought this very appropriate as this was my kid, and I know Darren who lost his own son Dre 20 years ago at the age of 14 months would take him to see it. So on the Sunday me and my daughter Latesha made our way through the mud to go to the green kids field, unfortunately I didn’t see Latesha stop and I assumed she had gone ahead, I couldn’t find her and I became tearful and panic. There were 2 stewards at the entrance of the green kids field and one bless him went to see if Latesha was inside, he came back with the Lady who runs the green kids field, she was so kind to me I just started crying, I also told them that Latesha was 27 year old. The lady said she thought I was looking for a small child, she took my arm and led me into the green kids field to the most magnificent tree that stood proud and felt like a Mother and alive, so alive. The lady told me that many people had proposed under the tree, had been conceived under the tree, and brought ashes and memories to the oak tree. I dug a hole and put some of Darren’s ashes in the ground and covered them over; I asked the oak tree to take care of his ashes and add them to the roots that she has, I spoke to Darren and told him that one day Latesha will bring some of my ashes to be with him and the amazing 500 year old oak tree. The 500 year old Oak Tree is a testament to all of us whether it be in a Spiritual way, an Environmental way, whatever way. I take comfort that my son will forever be at Glastonbury, and I thank the lady who runs the green kids field for her caring, her making sure I was ok, and she allowed me to tell her my story. 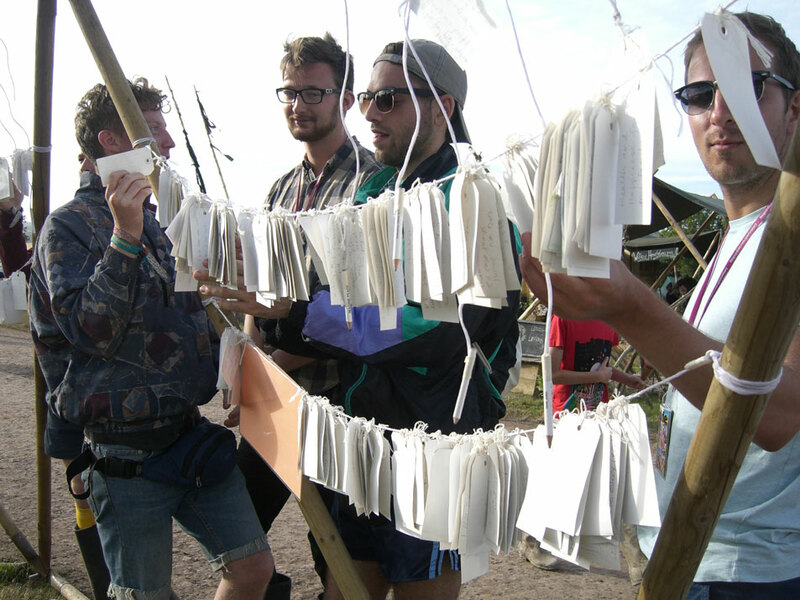 Glastonbury is more than a Festival; it is a spiritual journey that feels safe free and true. 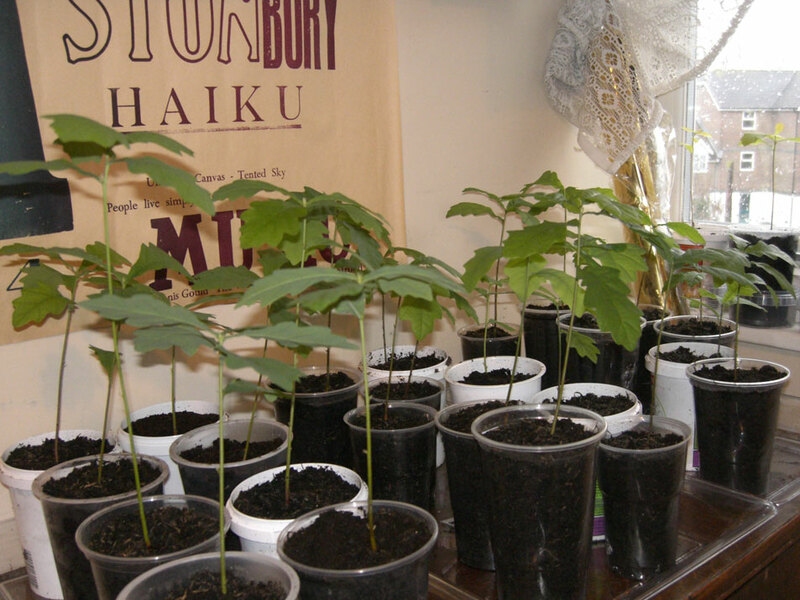 I planted some up and here is a photo of them – I’ve got about 40 baby oaks that will be planted out in the spring. It was really lovely doing them, and I hope this year we get another good harvest. I feel really proud that we have got this far, and that we can plant them for the future. I came down to the site on a quiet and wet weekend in September, and collected acorns from the Old Oak tree in Green Kids, and from the younger Oak trees in Craft Field. I was very lucky it was a good year for the acorn harvest. I collected about 200 acorns, and then spent the next month distributing them to everyone who had written in via this page – so they got sent to about 40 people around the globe – who will plant them and grow them. Most they stayed in the UK, but some they went as far as Poland, Canada, Germany, and America. It was the best year that I have known for the acorns. Well, at the end of the Festival 2015 we sent off TWO THOUSAND FIVE HUNDRED AND NINETY SEVEN wishes via Yoko and her team to the Peace Tower in Iceland. We ran Wish Trees on the Oak Tree in Green Kids Field; and on a dome in Green Crafts Field. We were also able to put wishes on the Pagoda in Kings Meadow that The Dalai Lama spoke from, so we all felt very honoured and blessed. ONE THOUSAND SEVEN HUNDRED AND THIRTY ONE WISHES FOR THE IMAGINE PEACE TOWER. 10 Oct 2013: Hi Everyone – – a glorious clear autumn day. I’ve just been on site and seen our wonderful Oak Tree. It has the best crop of Acorns that I have ever seen in my life… which is quite a short life compared to the Oak Tree. So, if any one out there would like a few acorns to have and grow into Oak trees, send your postal address to me at oaktreeproject@glastonburyfestivals.co.uk, and then I will send some out to you. There is plenty of adivce on the web about various ways of germinating acorns. The most important thing seems to be making sure they do not dry out before planting, and being very patient. You can start with it in a pot. 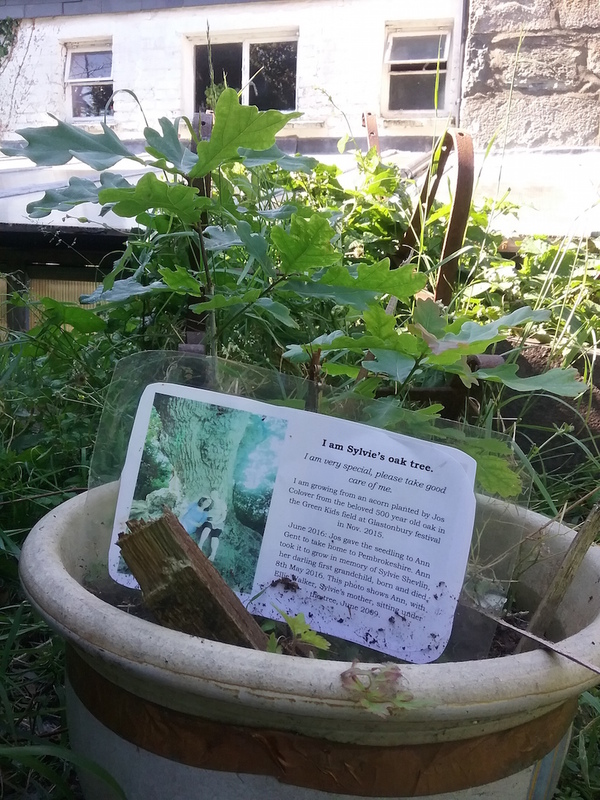 Even if you personally don’t have enough room to plant out a growing Oak, there will be plenty of people at the Festival in a couple of years’ time who would love to take it home and plant it out for you…. Jos and Suzie, the Oak Tree Project.